I haven’t done much sewing in the last few days, instead I’ve been cleaning. I’m not really nesting, per se, more like getting the last things done I HAVE to do before bringing home a new baby and having lots of people in my house. I’m due in less than 3 weeks and I’m starting to feel really exhausted every day! But alas, things need to be cleaned, organized, and put away, so I’ve been hard at work. 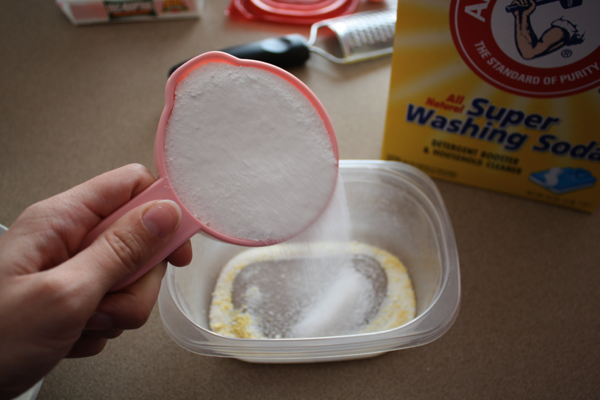 While I was cleaning up the kitchen yesterday, it dawned on me that I should share some of my cleaning secrets with you guys. Since I’ve spent the past 4 years either pregnant or breastfeeding, I’ve been really aware of what chemicals I bring into our house. I’ve never been a fan of cleaning, but I realized I hated it even more because of the strong smell of cleaners. I started searching for an alternate option about 8 months ago and I’m a convert! 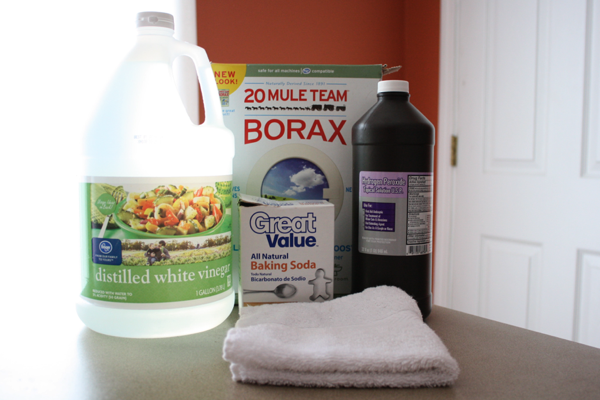 That’s right, I clean my entire house with Borax, vinegar, baking soda, and hydrogen peroxide! And water, of course. I also use it to clean the counters, walls, bathrooms and everywhere else that needs some cleaning. It does a surprisingly good job on mirrors, too! I also use vinegar in my dishwasher as a rinse agent and in my washer as a fabric softener. 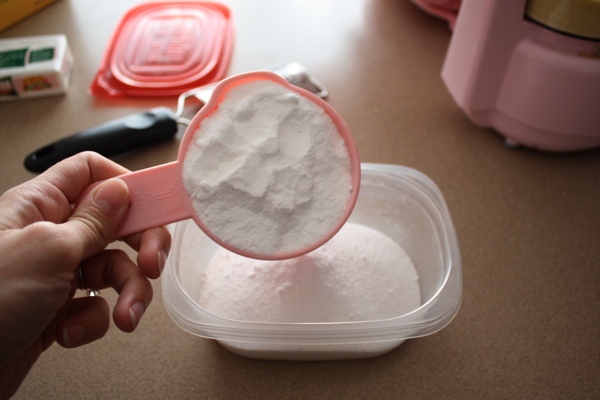 The Borax, baking soda, and peroxide I use mostly in the bathrooms. The Borax cleans my toilet bowl and soap scum in the tub. It’s great at getting rid of the ring around the tub, too! Peroxide gets rid of mold and mildew that appears in the grout, and baking soda is a back-up scrubbing agent. I do all the cleaning with old ratty washcloths I toss in the washer with my load of towels. I LOVE using these natural cleaners now! They do just as good of a job as any chemical you’d buy in the store, but they don’t stink and they’re safe for my girls to be around. How many times do you feel like you have to wash your hands while you’re cleaning to get all the nasty smell off them? And I never wanted to touch my kids while cleaning with those, either. But not any more! Now they can be in the bathroom with me while I scrub away and I don’t have to freak out if they touch something while I’m cleaning it. There’s also no overwhelming powerful smell of chemical clean, either! It’s just sparkling and shiny and smells slightly like vinegar. 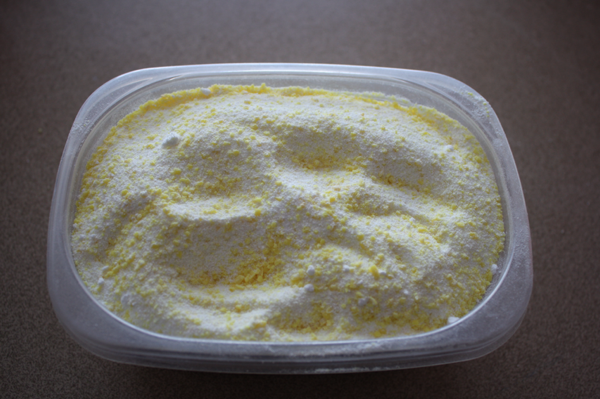 So looking for other natural household alternatives, I discovered making my own laundry detergent. It takes just a few minutes and costs me pennies per load! 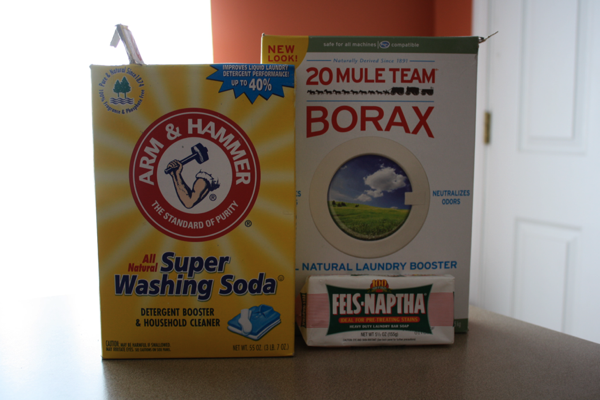 It’s just 3 simple ingredients: Borax, washing soda, and a bar of Fels Naptha soap. All these items can be found in the laundry aisle of any grocery store. I get mine at Walmart! 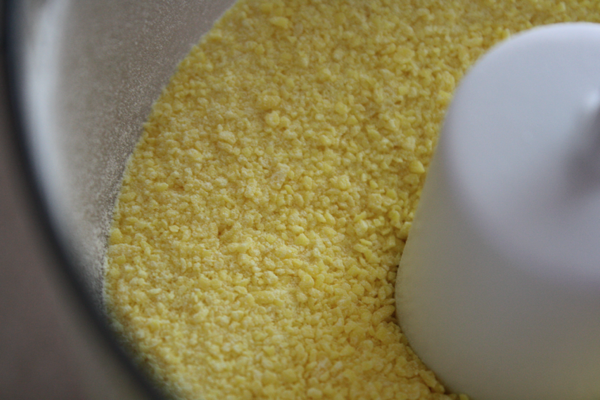 I start by grating my bar of Fels Naptha. 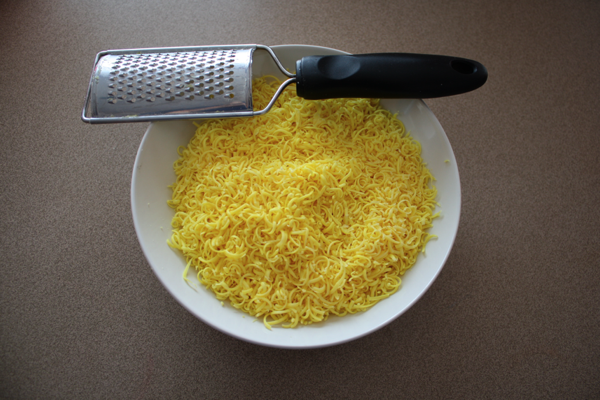 I use a small cheese grater and let it sit out overnight to harden up a little. Just make sure you keep it out of the reach of tiny hands–it looks like cheese! 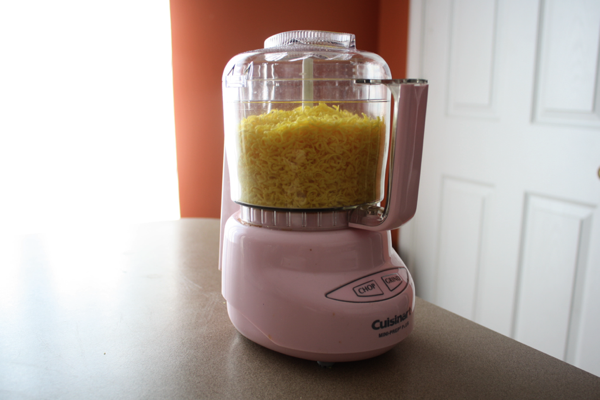 The next morning I stick it in my food processor and grind it up nice and fine. 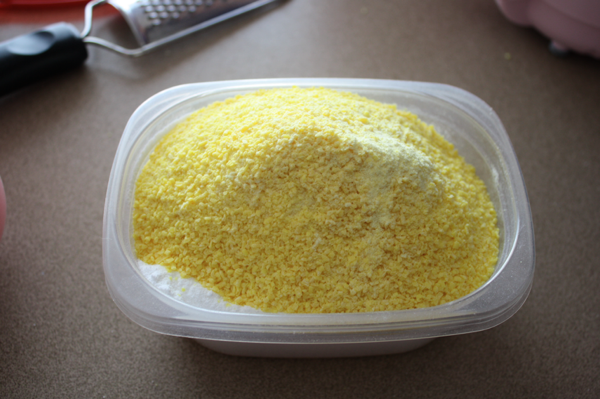 You don’t have to do it this way, just grated is fine, but I like to get it as close to powder as possible. 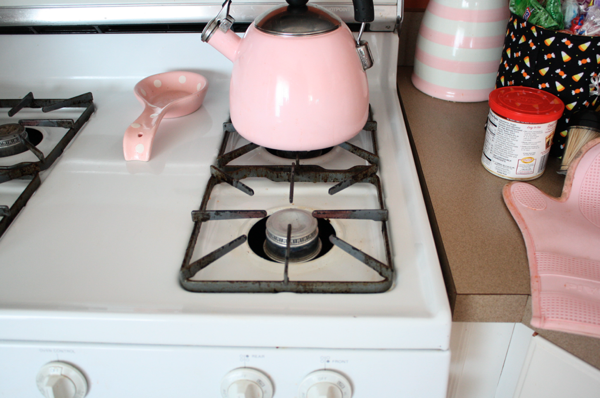 Stir well to incorporate, and stick the lid on it! I use 1 TBSP per load and this much lasts me around 25-30 loads. 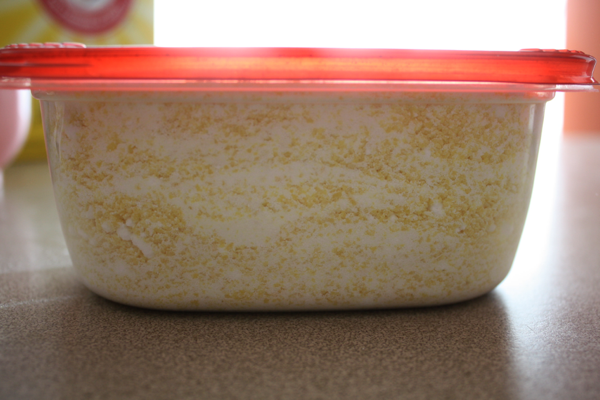 I figured it costs me about $1.50 per batch of soap I made, which averages out to $.06 per load. It’s not only extremely cost effective, but it’s a great detergent and gets our clothes clean! 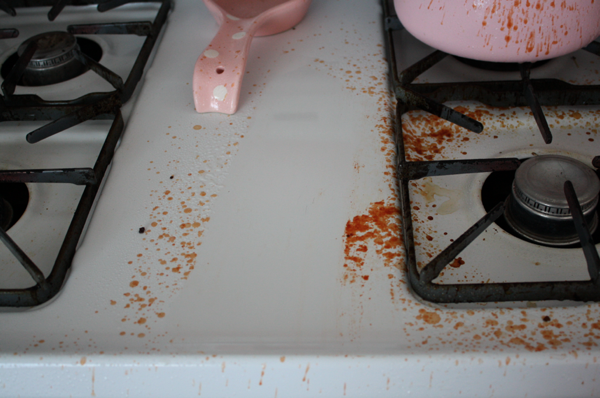 We’ve got little kids with big stains and I rarely have to use a pre-treater on anything. It also gets The Hubs’s gym clothes nice and fresh. 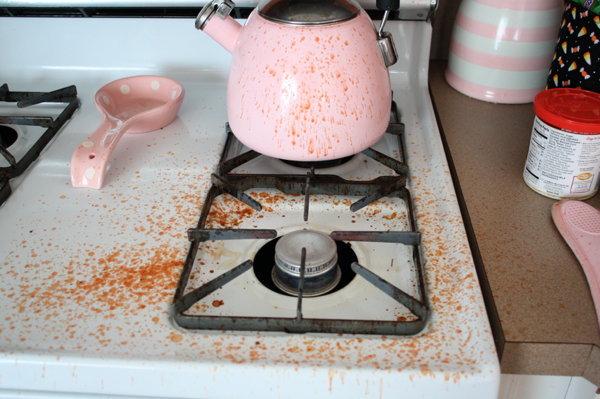 So go on, break with conformity and try some natural cleaners in your house! You just might be pleasantly, and monetarily, surprised! I’ll email you, too, but for anyone else, I would say bleach. Run a cycle (without clothes) on hot with bleach, then run one more with just water to make sure all the bleach residue is gone from inside the washer.